The holidays are fast approaching and I don’t know about you, but they seem to sneak up on me every single year. This year, I decided to get ahead with my planning and start looking for recipes that suit my gluten-free dairy-free diet early. 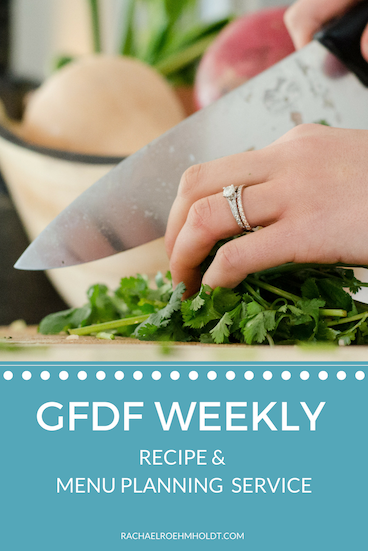 But once I got started, I realized how useful this could be for YOU too, so I got to work on my next 101 gluten-free dairy-free recipe roundup – this one is dedicated to all things holiday! If you want to stick with your gluten-free dairy-free diet over the holiday season and continue to feel your best, there are so many great recipes out there for you. I’ve done my best to hand-select recipes that are not only on the healthier side (sorry, it’s the health coach in me), but are super flavorful, and are good replacements for some of your favorite dishes – only gluten-free dairy-free versions of the recipes. One thing I noticed as I was picking out these recipes and going through all of them, that the substitutions that I share in all my recipe roundups are almost entirely the same Replace butter for vegan butter or coconut oil, omit cheese, replace all-purpose flour with gluten-free 1:1 measure flour blend, use gluten-free oats, and when buttermilk is called for – make your own using dairy-free milk and a dash of apple cider vinegar. If you follow those rules as you’re finding your own recipes, you’ll be able to make any ‘normal’ recipe a gluten-free dairy-free one. My goal for this recipe roundup is to make this your one-stop resource in finding recipes you can actually make and enjoy this holiday season. 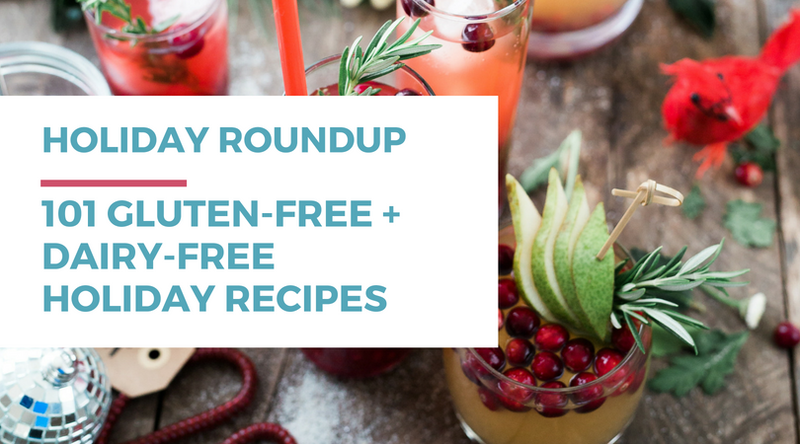 In this gluten-free dairy-free holiday recipe roundup, I’ve divided these 101 recipes into 10 different categories: breakfast, appetizers, main courses, Thanksgiving, Christmas, crockpot, side dishes, vegetables, holiday drinks, and holiday desserts. I hope that as you’re making your holiday menus over the next few months, this post will become a super valuable resource for you. Alright, let’s get to the recipes, yeah? These hot cross buns are great any time of year, but are extra special for holiday breakfasts. These are gluten-free, dairy-free, and have major flavor from currants or raisins and spices like cinnamon, allspice, and nutmeg. This sweet potato sausage breakfast casserole is perfect for any breakfast or brunch around the holiday season. It’s hearty, filling, and has no added sugars, gluten, or dairy. Easy fiesta potatoes are delicious as a side dish for any holiday breakfast. These are made with potatoes, bell peppers, and onions. Be sure to check the garlic spread and seasoning to make sure it’s gluten-free and dairy-free. Cinnamon apple berry baked oatmeal is easy to make and is gluten-free, dairy-free, and egg-free. This is a great option for a holiday morning, because you can be busy doing other things while it’s baking up in the oven. This make-ahead Mexican breakfast casserole has two make ahead options. First, it can be combined the day before, refrigerated, then baked in the morning. Or you can bake it ahead of time, then serve when you’re ready for it. And of course since I’m sharing it, it’s gluten-free and dairy-free friendly. I feel like I’m constantly on the hunt for a good french toast casserole recipe – and this one looks simple and straight forward. Perfect for any holiday breakfast. This one only takes 10 minutes of prep and one hour of cooking time. These apple cider glazed donuts are a delicious treat you can enjoy any time of year, but are especially yummy as a holiday breakfast idea. Making gluten-free and dairy-free donuts at home is easy as long as you have a donut pan on hand. Hot spiced fruit bake is an awesome side dish idea for a holiday breakfast. This dish is loaded with apples, pears, fresh cranberries, and pineapple chunks and naturally sweetened with coconut palm sugar and maple syrup. Everything is topped beautifiully with raw walnuts or pecans. This chai tea inspired quick bread recipe is a fun breakfast idea for any holiday morning. This one is made with oat flour and tapioca starch, so you know it’s gluten-free and non-dairy milk so it’s dairy-free too. These beautiful chai gingerbread waffles are the epitome of holiday breakfast foods. These waffles are infused with a homemade chai spice blend and topped with a delicious cranberry topping. Paleo gingerbread muffins are the perfect breakfast treat to tide you over while opening gifts on a holiday morning. These are great, because they’re made with a mixture of almond flour and coconut flour and loads of spices like allspice, ginger, and nutmeg. Need a little support sticking with your gluten and dairy-free diet through the holiday season? 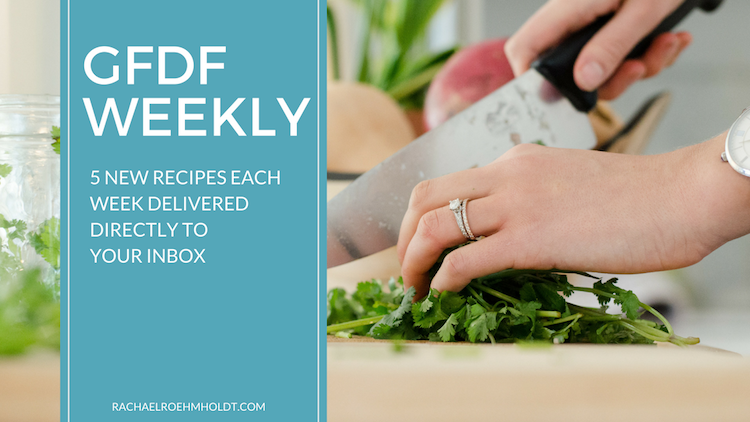 Be sure to sign up for my weekly recipe and menu planning service, GFDF Weekly. Click here or the image below for details. These gluten-free sausage balls are an excellent appetizer idea for any holiday. These use almond flour in place of traditional flour to make them gluten-free. To make them dairy-free, be sure to swap out the butter for vegan butter and use a dairy-free cheese like Daiya or omit the cheese altogether. These maple candied pecans are simple and take only 3 ingredients and just 5 minutes to prepare. These come together with pecans, maple syrup, and cinnamon so they’re gluten-free and dairy-free. These will be a hit for serving guests during your holiday get-togethers. These sweet cucumber roll-ups are simple to put together and are full of delicious and healthy ingredients like pine nuts, hemp seeds, smoke salmon and cucumbers. Make up a batch of these gluten-free and dairy-free appetizers to wow your friends. Roasted Brussels sprouts with bacon aioli are a great appetizer that’s healthy and a fresh twist on your standard hors d’oeurves that are often served. The bacon aioli is made using a dairy-free mayo, lemon juice, garlic, bacon, and fresh thyme. Super easy and super flavorful! This simple Irish Soda bread is one of those very simple recipes that seems super fancy and difficult, but is actually simple to put together. This one is gluten-free with the use of cassava flour, but you’ll need to do some swaps to make it dairy-free. Swap out the butter for vegan butter or coconut oil, and the raw buttermilk will be a combination of dairy-free milk and lemon juice. There are plenty of gluten-free crackers on the market these days, but if you like to make your own homemade versions to brag to all your friends – this is a great recipe to try. These only take 30 minutes to make from start to finish and are great with any dairy-free dip you want to serve with them. If you love serving meatballs at holiday gatherings, these ones are a great one to try. These are baked in the oven, so you don’t need to babysit them on the stove, and best of all, they’re paleo, gluten-free, and dairy-free. Spinach and artichoke dip can be a tricky one to make dairy-free since it’s usually loaded with cream cheese and loads of cheese. This gluten-free and dairy-free version is made with cashews and mayonnaise for a healthier dip. This vegan roasted beet dip is simply gorgeous and will be a wonderful addition to your holiday appetizer menu. It’s a deep pink/red color and will be great served with gluten-free crackers or other veggie sticks. I don’t know about you, but when I’m entertaining, I don’t want to be spending more time in the kitchen than I have to. So these make-ahead vegan spinach balls are awesome you can spend more time on the main dishes – and less time in the kitchen. These are even freezer-friendly so you can have them on hand for any impromptu holiday entertaining too. This perfect prime rib roast is a lovely holiday main dish idea. I don’t know about you but my family oohs and ahhs over a prime roast during the holidays – and this one is awesome, because there’s no gluten or dairy. You can feel good about indulging in this one. If you love chicken around the holidays or for holiday entertaining, this garlic rosemary chicken is extra festive with the addition of red and green from the cranberries and rosemary. There’s no flour or butter in this recipe, so it gets the thumbs up for being gluten-free and dairy-free too. Prime rib can be made loads of different ways, but this one really looks festive for the holidays. This one is made with a garlic, thyme, and rosemary crust and topped with a gorgeous green gremolata. Baked ham is a quintessential holiday main dish and this one is super yummy with the addition of apple cider as the base of a glaze. I feel okay about using butter in this recipe since it’s on the glaze, but you can always swap for vegan butter or coconut oil if you’re more comfortable with that. My grandma makes a sweet potato casserole for every Thanksgiving and Christmas for our family – we love it so much. 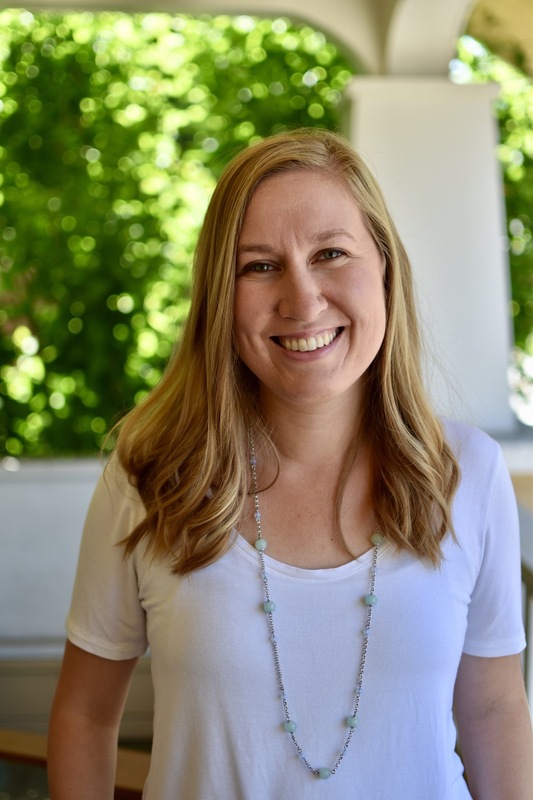 When I first went gluten and dairy-free, she had no idea how to make changes so I could eat it. Here’s an awesome GFDF recipe for you to check out if your family loves sweet potato casserole too. These cinnamon roasted sweet potatoes and cranberries are a wonderful Thanksgiving side dish idea, because they combine such classic Thanksgiving flavors. This recipe is only 6 ingredients and looks gorgeous too. This pistachio crusted salmon is easy enough for any weeknight, but is beautiful enough to serve at a holiday event. This is quick and easy to put together and uses basic pantry ingredients. Best of all, it’s gluten-free, dairy-free, and can be made in 30 minutes flat. This green bean casserole is a classic Thanksgiving side dish transformed to be healthier and gluten-free dairy-free. The secret to this reinvented dish is raw cashews to make a dairy-free creamy texture instead of cream-based soup. The other secret is to make your own ‘french fried onions’ to go on top. 30. Crock Pot StuffingThis bacon wrapped stuffed pork tenderloin is a lovely main dish, because it seems super duper fancy, but isn’t too difficult to put together. This recipe calls for homemade breadcrumbs, but definitely be sure to use a gluten-free bread for this to make it fully gluten-free and dairy-free. This stuffed pork loin is gorgeous filled with a deep red cranberry and rosemary sauce. This recipe is dairy-free, and can be made gluten-free by swapping out the whole-wheat breadcrumbs for gluten-free breadcrumbs. Crockpot stuffing is made with wild rice, cranberries, and almonds – all delicious and classic ingredients for a Thanksgiving dish. Other than being gluten-free and dairy-free, the other big reason I love this is that it’s a real time-saver by using your crock pot. It looks hearty and delicious! These caramelized sweet potato apple hash browns are a little bit of Thanksgiving breakfast inspiration for you. It’s made with – you guessed it – sweet potatoes and apples, is gluten-free and dairy-free, and and is made with only 6 ingredients. If you want to serve a festive appetizer at your Thanksgiving dinner this year, try this roasted pumpkin walnut dip is just for you. This recipe is Low FODMAP, gluten-free and dairy-free, and is great with veggie sticks or gluten-free crackers. These mini vegan pumpkin pie cheesecakes are gluten-free, dairy-free, and super easy to prepare. They don’t require any cooking at all so if you have a muffin tin and all the ingredients, you can whip these up in no time. Enjoy them for a delicious and portion-controlled dessert. This gluten-free stuffing is made with homemade gluten-free bread, which is completely gluten-free and dairy-free. This recipe involves a little more effort than buying store-bought bread, but it will be worth it once it’s done and it’s super flavorful – and safe for your GFDF diet. This grain-free apple pie is an awesome gluten-free recipe that can be made dairy-free too by swapping out the butter for vegan butter or coconut oil. This recipe uses a mixture of almond flour, coconut flour, and arrowroot starch as a base for the pie crust. And it’s filled with two types of delicious apples in the homemade filling. Yum! Did you know mashed potatoes don’t require loads of butter and cream to make at home? These mashed potatoes are made using a surprising ingredient in place of all that dairy – chicken stock. The chicken stock provides the moisture and flavor that you want in mashed potatoes without all that stuff that makes you sick. This Christmas tree vegetable platter is a fun and festive vegetable dish to add to your Christmas dinner spread. Obviously since it’s just veggies, it’s gluten-free and dairy-free. And of course, to make sure it’s 100% gluten-free dairy-free, you’ll want to a GFDF dressing for dipping and gluten-free pretzels for the stems. These vegan gingerbread waffles are a lovely Christmas breakfast idea to make the most of the holiday’s spices and flavors. 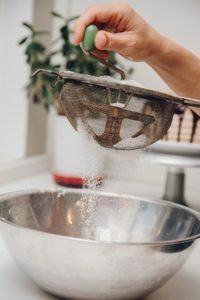 In order to make this recipe fully gluten-free and dairy-free, use buckwheat flour or a mixture of teff flour and brown rice as a replacement for the whole wheat flour. If you’re looking for a few strategies to get through the holiday season and stick with your gluten-free dairy-free diet, check out this video I made! Cranberry walnut sweet potato wild rice pilaf is a great side dish for your Christmas dinner. It’s also a nice replacement for a traditional stuffing that you might find on most holiday spreads. This lovely dish is beautiful in color and is a total show-stopper. Need a holiday ham recipe that you can feel confident serving yourself and your family? Try this pineapple glazed holiday ham. This recipe is fully gluten-free and dairy-free, and full of flavor. If you like to switch up your Christmas breakfast menus every year, give this pecan pie baked oatmeal a try. This recipe can be made ahead and is full of healthy gluten-free and dairy-free ingredients, like rolled oats (be sure they’re GF! ), ground flaxseed, eggs, coconut oil, and pecans. It’s like dessert for breakfast – but healthier! These dairy-free gluten-free cinnamon rolls are a great recipe to have on hand any time of year, but especially around Christmas, when you want to make a special treat. These are made using Pamela’s Gluten-free Bread Mix and Pamela’s Gluten-free All-Purpose flour. This wild rice salad made the cut for a Christmas gluten-free dairy-free recipe to share with you, because it’s loaded with healthy ingredients like wild rice, arugula, pecans, cranberries, and pomegranate seeds. This recipe is gorgeous with green and red hues perfect for the holidays. Just be sure to omit the feta cheese to make it dairy-free. This homemade vegan egg nog is a great dairy-free alternative to the classic holiday beverage that many love. Instead of cream and eggs, this recipe uses cashews, dates, banana, avocado, vanilla, and lots of spices to recreate the same creaminess and flavor but wayyyy healthier. I find myself enjoying a lot more hot chocolate around the Christmas season and in order to really feel my best, it needs to be dairy-free. Give this dairy-free peppermint hot chocolate recipe a try if you love it too. If you find yourself overindulging a little too much around the holiday treats this time of year, try out these super healthy chocolate mint balls. They taste great and are good for you – no guilt around enjoying these. All you need are 5 ingredients: dates, walnuts, cacao powder, shredded unsweetened coconut, almond milk, and peppermint extract. This honey garlic beef tenderloin is the perfect main dish to serve at your holiday dinner. It’s slow cooking at its finest since this cut of meat is perfect low and slow. The best part is that while you’re cooking away on your side dishes, your main attraction will be ready when you are. Slow cooker brisket and onions is simple to put together and gorgeous for serving at your holiday table – or any weeknight for that matter. This main dish cooks up in about 6 to 8 hours on low – and best of all, it’s even BETTER when you make it a day ahead. These green beans are made using just 5 ingredients – green beans, onion, garlic, chicken broth, and salt). These are gluten-free, dairy-free, and EASY. Plus you can have them going in your crockpot while you get other more important dishes done around the holidays. If you’re one to feel guilty for the massive pile of mashed potatoes on your plate during the holidays, this recipe is for you. This loaded cauliflower mashed potato recipe is perfectly gluten-free, healthier than regular mashed potatoes, and can be made dairy-free by using olive oil instead of butter, and swapping out sour cream for coconut milk. Omit the cheese and you’re set. Balsamic Brussels sprouts are the perfect side dish for your holiday menu. These will help you get your greens before everyone flocks to dessert. These only take 10 minutes of prep time and cook low and slow while you work on the rest of your meal. I love mashed sweet potatoes year round, but they really do scream “holidays” to me. These come together with just sweet potatoes, water, salt, pepper – and you can make them dairy-free by swapping out ghee for vegan butter. To make dairy-free mashed potatoes, you make them like you would regular mashed potatoes and simply swap out butter for vegan butter and milk for chicken stock or other dairy-free milk. This recipe calls for chicken stock and vegan butter. Better yet – your slow cooker does all the heavy lifting on this recipe. No more watching the water (and potatoes) boil. I used to think making homemade cranberry sauce must be super complicated, but when I started bringing it to my family’s events – I decided there really wasn’t much to it. This recipe makes it even easier – your slow cooker does everything for you. If you can get even one or two shortcuts using your slow cooker during the holiday season, I say take it! I’m not sure that balsamic roast beef is necessarily considered a holiday meal, but this recipe looked divine. Even if it wasn’t a holiday itself, I think I’d be happy to serve this around the holiday season to my family or if friends were to come for dinner. You can even use different cuts of meat to make this so you have options. The only caution is to double check your dry onion soup mix is gluten-free. If you love butternut squash during the holiday season either on its own or to use in other recipes, this crockpot recipe is awesome. You literally need one ingredient: butternut squash – and one tool: your slow cooker. All you do is place the whole squash in your slow cooker and let it go for 4 to 5 hours on high or 6 to 8 hours on low. Easy peasy! >> Check out Amazon’s bestsellers in baking tools & accessories here. These gluten-free pull apart dinner rolls are an awesome recipe to keep handy during the holidays. It’s tough to find a bread or roll recipe that doesn’t have gluten or dairy – and that turns out. You can make these dairy-free by substituting the butter for vegan butter or vegetable shortening. Bacon zucchini fritters probably aren’t what you expect around the holidays, but why not? These are beautifully green, gluten-free, dairy-free, and loaded with bacon. Yum! These crispy Brussels sprouts are seriously impressive and even if your family members don’t think they love Brussels sprouts, this recipe might just change their minds. This recipe is made to dip with homemade basil cashew sauce which is also dairy-free. What’s not to love? I don’t think I’ve tried scalloped potatoes since going gluten-free and dairy-free. Honestly, I didn’t think it was an option with all the substitutions I’d have to make. But this recipe has proven me wrong! I actually really can’t wait to try this one. Roasted spicy cauliflower might not be what you’re used to on the holiday table, but this is a great way to add more veggies to the otherwise carb-heavy day – and you don’t have to feel a bit guilty for enjoying it. These cinnamon roasted carrots are an awesome addition to your holiday menu. These are gluten-free, dairy-free, and are easy to make with minimal prep needed. Best of all, they’re ready completely in just 30 minutes. Okay, so this baked herb potato round seems like a little more effort than I’d put in on a dish – but as an appetizer when you’re looking to impress your family around the holidays? Totally worth it. These only take 4 ingredients and about 30 minutes of time. This gorgeous side dish is creamy and buttery in texture, is full of flavor, and nutrient-dense too. Cauliflower butternut squash mash is a great substitution for mashed potatoes or sweet potatoes and is gluten-free and dairy-free. This kale caesar salad with crispy smoked chickpeas is for the salad lovers around the holidays. I know many folks love to serve salad at every holiday meal (my mom is one of them), and this recipe couldn’t be healthier. It’s gluten-free, dairy-free, and even high in fiber. These stuffed mushrooms have no gluten, dairy, and are an awesome side dish or appetizer any time of year – but impressive at any holiday gathering. These are made with a filling of walnuts, spinach, and sundried tomatoes. Yum! I’ve made these lovely rainbow roasted vegetables for a holiday side dish for my family’s get-together before and was pleasantly surprised by how much everyone liked them. Even those self-proclaimed non-veggie-eaters were taking generous portions. This recipes brings loads of color and nutrients to your holiday table. Honey mustard carrots are made using just 4 ingredients, need almost no prep time before cooking them, and they’re great for kids. All you need are a package of baby carrots, olive oil, honey, and spicy brown mustard. We’ve had a variation of this cranberry almond spinach salad at our holiday dinners for a few years now, but what I love about this recipe is that it’s made with a homemade sesame seed dressing that looks super flavorful AND easy to make. What could possibly make green beans better? Brown sugar and bacon. And this recipe delivers. To make this recipe, you only need 5 ingredients and about 20 minutes. For it to be dairy-free, use coconut oil or vegan butter in place of the butter. This super simple side dish is loaded with sweetness and will be a welcome dish at any holiday table. These are gluten-free and dairy-free and take less than an hour to make. Super simple, super yummy. This delicious side dish is made with Brussels sprouts, carrots, toasted pecans, and dried cranberries – then topped with loads of fresh herbs. Simple fresh ingredients make this gluten-free dairy-free dish come to life. I don’t know if this could be considered a holiday side dish, but I know I would certainly eat it at my holiday dinner – or any night of the week for that matter. Collard greens are cooked low and slow in the crock pot with ham hocks, onion, garlic, and jalapeno peppers. It might not be traditional holiday food, but it sure looks delicious! If you want to stay away from grains entirely for this holiday, try this cauliflower stuffing instead. This recipe is loaded with fresh vegetables and herbs for a super healthy and low-carb stuffing. Be sure to make it dairy-free by swapping out the butter for vegan butter or coconut oil. This recipe is insanely gorgeous with greens, oranges, and reds. I would make this one just to look at it – but really, this delicious recipe is made with roasted Brussels sprouts and roasted butternut squash, then comes together with pumpkin seeds and cranberries at the end. I can’t wait to try this one! I love recipes that only use a few ingredients and have loads of flavor. These garlicky red potatoes need just olive oil, garlic powder, salt and pepper, and a lemon to make them really come together. Easy, delicious, and makes plenty to go around. I love hot chocolate around the holiday season – and since dairy isn’t an option, homemade is usually best. This great creamy dairy-free hot chocolate recipe is awesome on its own, but you can mix it up with any of the 4 variations included, like Mexican cocoa, mocha, orange, or peppermint hot chocolate. Yum! Need an adult beverage for your holiday dinner but want to be sure it’s definitely gluten-free and dairy-free? Try this festive cranberry apple cider sangria. This recipe comes together with red wine, apple cider, cranberry juice, orange liqueur, honey, and fresh cranberries and apples for garnish. Looks delicious! If normal hot chocolate isn’t your thing, try out this dairy-free white hot chocolate instead. This recipe uses canned ‘lite’ coconut milk, raw cashew butter, cocoa butter, maple syrup, vanilla extract, and salt. Try this creamy and induglent drink to warm you up through all of winter. This Thanksgiving punch looks too delicious not to try! I can already envision drinking this at Thanksgiving dinner and all the kids going crazy for it too. This recipe uses apple cider, caramel syrup (double check that it’s not sugar-free, some of the sugar-free varieties do contain gluten), pumpkin pie spice, and cinnamon sticks and sliced apples as garnish. Apple pie in any form sounds delicious to me, but this apple pie punch has me super curious. This recipe comes together with apple cider, pear nectar, ginger ale, and a diced apple for garnish. This would be great for Thanksgiving, Christmas, or any other holiday get-together you may be throwing this season. If you’re looking for a fancy alcoholic drink just for the grown ups that feels festive and tastes great, this sparkling apple cider sangria is perfect for you. This recipe comes together in a pitcher, then you can serve it up into individual portions. You can even make this one non-alcoholic by replacing the Cava that’s called for with seltzer water. Cranberry orange holiday punch is delicious and easy to make for your holiday guests. Of course, there’s no gluten or dairy, and needs a few ingredients to make up 7 cups of this tasty drink. Love Moscow Mules? This Thanksgiving variation on the drink is for you. This drink calls for ginger beer, cranberry juice, and spiced rum. My husband is a big fan of peppermint mochas – he drinks them year-round! Weird, right? Well this recipe is for him. It’s free of all top 8 allergens, and LOADED with healthy ingredients like cacao powder, Dandy blend, hemp seeds, coconut oil, raw honey, collagen powder, L-glutamine powder, chaga powder, and peppermint extract. Super simple and good for you! Everyone loves pumpkin spiced lattes this time of year, right? Well give this dairy-free homemade version a try – it’s probably 10 times better for you than the ones you can find at the coffee shop, and well, actually has pumpkin in it. Pumpkin pie is the quintessential Thanksgiving dessert, but it’s not perfectly straight-forward how to make this gluten-free and dairy-free without shelling out tons of money for extra ingredients, amiright? This gluten-free and dairy-free maple pumpkin pie will make sure even us GFDF folks can enjoy our holiday and round out the meal with our favorite dessert. These German chocolate pecan pie bars are like two desserts made a baby and out came this delicious heaven. These are sweet, but use healthy sweeteners like coconut sugar and maple syrup. And of course, they’re gluten-free and dairy-free. Score! You can’t get more festive than peppermint, right? Well these super tasty peppermint macarons are great for serving – and wowing – your holiday guests. These are made using Bob’s Red Mill almond flour, so you know they’re naturally gluten-free. And they’re made into sweet little macaron cookie sandwiches with a delicious dairy-free chocolate ganache. What could be better? Gluten-free apple spice cake is great for an alternative Thanksgiving dessert if you’re sick of (or want extra options in addition to) pumpkin pie. These are super simple to make and only require one bowl and no mixer. Hands up for those of us who like doing less dishes around the holidays!! These paleo buckeyes are a healthier version of the traditional peanut butter holiday cookie with way less sugar – and guilt. These come together with just 5 ingredients (plus a chocolate coating with 2 more ingredients). Simple, healthy, delicious. I’m sold. I don’t think I’ve ever heard of cookie bark before, but I’m not sure why not. This recipe looks divine. Instead of chocolate layered on more chocolate – this recipe is all kinds of goodness stuck together with a chocolate bark. Chocolate cookies and peppermint are piled on this chocolate bark into a seriously yummy treat. Make some to share – or don’t, because this one looks amazing. These big chewy gingerbread cookies are gluten-free, dairy-free, and just scream holiday goodness. Enjoy these tasty cookies in just under 30 minutes. Best of all, these have no refined sugar! Fudge is one of those simple holiday go-to recipes that people love to make around the holidays, but without the gluten and dairy, this one can get a little tricky. Try this dairy-free fudge recipe – and make it your way (with or without nuts). Be sure to use dairy-free chocolate chips in this one! Gingerbread and cheesecake got together and made this amazing mashup of gingerbread cheesecake bars. These have a crunchy cookie-like base, and a cheesecake on top that tastes just like gingerbread with ginger, cinnamon, cloves, and nutmeg. How can you go wrong there? 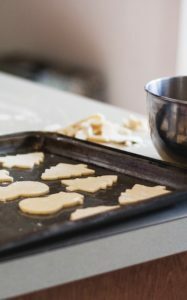 Need a basic sugar cookie recipe to create with your kids or to share with the people you love? Try this gluten-free and dairy-free version that’s great for cutouts of any shape and size you wish. As you can see, you definitely can stick to your gluten-free dairy-free diet this holiday season from Thanksgiving all the way through to the New Year. There are so many great options for you – and substitutions when you need them to make this your best holiday yet. Best of all, you know that when you stick with a diet that makes you feel your best, you won’t have to spend days in the middle of the festivities recovering from being overloaded with gluten and dairy. You can actually enjoy all that’s going on and feeling good in your skinny jeans all season long. If you loved this recipe roundup, I’d love for you to share it on Pinterest and Facebook, or send it to a friend. And if you’d like to receive more information on going (and staying) gluten-free and dairy-free all year long, I’d love to have you check out my FREE shopping list PLUS 5 easy recipesby entering your information below. Thanks so much for including my Cranberry Mule recipe in your round-up! This is seriously AMAZING, and I’m passing it along to my gluten free friends so they have this amazing resource. Hey Chrissy, thanks for checking it out and leaving a comment! Thanks so much for sharing 🙂 I hope you find some amazing recipes to try this holiday season!